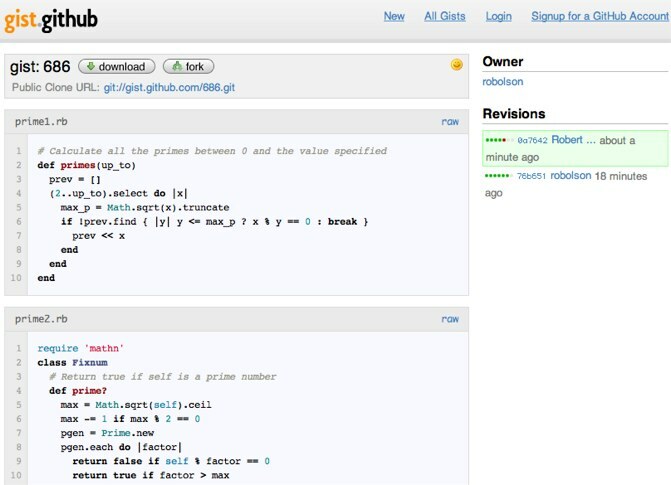 GitHub, the popular service for hosting Git repositories, has taken a step outside the box and improved upon the classic pastie service (place for coders to post code snippets). To do that, GitHub took the same formula that has proved successful with their repository hosting service and applied it to pasties. The result: a new service launching today at gist.github.com. What does this mean for pastie users? Each pastie, or gist, is its own Git repository. By placing pasties inside a git repository, GitHub is able to redefine how pasties work. Pasties can be forked and improved upon by another user. Any improvements can then be sent back to the original author in the form of a patch. Making each pastie its own little open source project. GitHub has also built in the ability to edit pasties within the web browser. Each edit is saved as a revision in the Git repo, allowing for commits to be made online as well. The GitHub team is planning on bringing this functionality over to their main application. Their hope is to eliminate the need for users to become familiar with the Git version control system before they can contribute to GitHub projects. This will also be helpful to people who want to submit a patch that does not require any testing first, like documentation patches. Since most developers use source code management systems other than Git this may be an important step towards GitHub’s goal of enabling greater collaboration in open source projects. Gist is not a complete product yet. Most notably, it is missing the ability to delete pasties. A search for existing pasties would also be beneficial. Since GitHub repository hosting is also missing a full text search, it is feasible that GitHub will develop a search for pasties first and then expand it to all repositories. The missing functionality did not hold back the GitHub community from jumping to gist.github.com. Over the last 24 hours, Gist received more pasties (724 as of this writing) than the leading pastie service, Pastie.org (who is at 524). Even though GitHub is only about eight months old, they already host just over 10,000 open source projects. More importantly, they are already profitable with paying customers for their private repository hosting service numbering in the thousands. GitHub has done a good job at distancing themselves from SourceForge, the leading host of open source projects, by adding community aspects that benefit not only users but the open source projects themselves. The most prevalent is the ability to track contributions to your favorite projects, making it easier to follow what is being done on projects you either use, or are a member of. While SourceForge has been stagnating for a decade, GitHub is transcending them by offering progressive features like followings, activity feeds, and a cleaner design.